Each Wednesday, I take stock of the projects I’m working on, and where my brain is at. More weaving this week. And it’s gotten me thinking even more about the connection between process and project (product). Are you in it for the process? Or for the product (project)? to play and dance off of one another. There are plenty of ways to create fabric. once the fabric is finished. I don’t know what I’ll do with this fabric once it’s done. But I want the fabric. because weaving is faster than knitting. in the middle of my self-made wardrobe project. a slip stitch knitted sweater with this lovely pile of autumnal yarn. like in my crazy colorful sweater (that still needs sleeves). But that never ended up happening. And so the yarn sat. And sat, and sat, and sat. And then I borrowed a loom. Originally I borrowed the loom for a totally different project. But I wanted to get some practice first. I’ve woven before, but not on a rigid heddle loom. two colors at a time, five colors in total, plus the color of the warp. Last week, I started and finished, and was entranced by the process. Entirely entranced by the process. 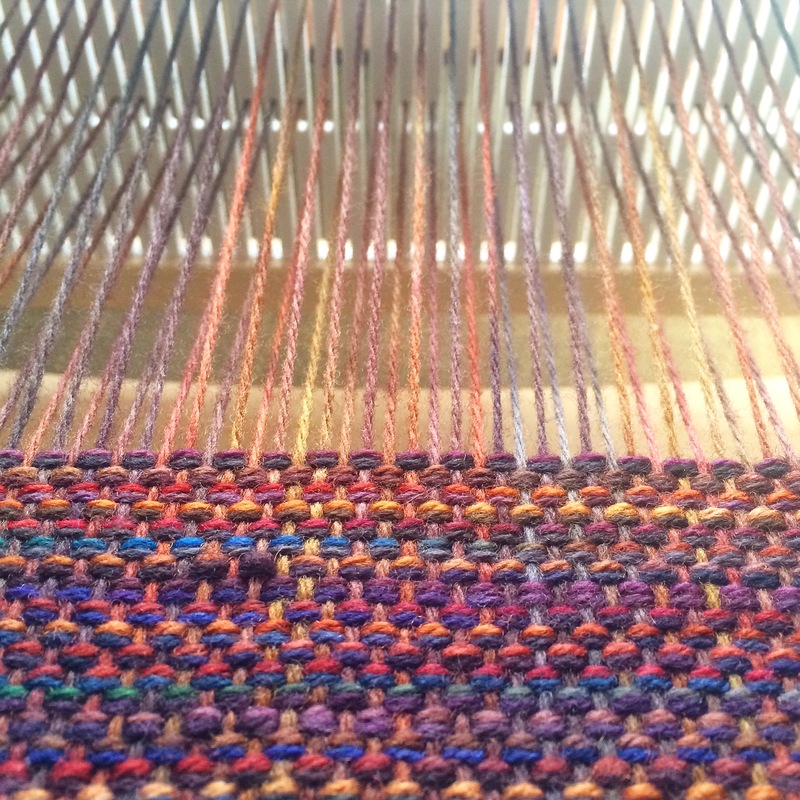 that I have no internal rules about weaving + color. I have many internal rules about knitting + color. “what the hell are you talking about? With my knitting, I plan the whole project from the beginning. I can visualize the finished piece. The beginning, the middle, and the end. With my weaving, I don’t. I don’t care that, the end and the beginning are entirely different. I don’t care that, the middle stops and starts. I don’t care that, the transitions between colors aren’t smooth. I don’t care that the piece of fabric doesn’t look visually complete. And I want the fabric for it’s malleable fabric essence. I want to create the fabric because this fabric isn’t in existence anywhere else. I want the fabric to be fabric, I’m just going to cut it up anyway. The project isn’t done yet. The final project isn’t even started yet. Because the product is different.